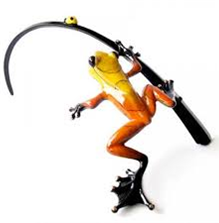 Hot Shot, signed rare Frogman Bronze sculpture by artist Tim Cotterill. In brilliant yellow and orange, this hot shot has know doubt it'll reach the lounging ladybird before it. Hot Shot is a rare Frogman Bronze and Edition Variation of Little Ladies. A wonderful solid bronze frog sculpture signed by artist Tim Cotterill. Dimensions 6" x 4" x 2.75"